2. Graphic Settings; Check all if you're not sure for your PC's performance. *Just like a usual fighting-game, the num-pad represents a direction. If the Master's HP is completely depleted, you lose. Each use consumes 1 command spell (usually, there's 3 command spell per master) and 1 Mana bar. Every time you use a power up (Ability Burst or Bazett's power-up), this bar will appear. This bar indicates how long the power up will last. When the Sub-bar depletes, the power up's effect will also wear off. This is used for executing Last Resorts. See the number circled by a black circle (the 3/3)? the left one indicates your current mana, and the right one indicates your maximum capacity. When your mana has reached it's max. capacity, you can't increase your mana anymore (before you spent it). Sometimes, a character (usually a master) has a special token. That character's attack(s) may need the token to be spent, so this is also act as a limiter for the character's attack(s). example: An attack requires 4 jewels to be spent. If your remaining jewel(s) are less then 4, then you can't execute that attack. This Command Spell can only be used for servant. If you use this while you're controlling the servant, He/She will be teleported out, and you'll control the master instead. If you use this while you're controlling the master, He/She will call the servant, blows the enemy away, and change control to the servant. Several attacks may inflict 'stun' on the enemies, indicated by the electricity around them. When the opponent is in 'stun' mode, several attacks has additional effect; most of them has the 'unblockable' effect. Throwing the enemy while they're stunned will have an extra animation and damage. This game has a penalty for a combo chain. The longer the combo, the lesser the damage per attack will be inflicted. Example : When the combo count is still below 10, an attack does around 50 damage per hit. When the combo count is around 100, the attack does only around 2 damage per hit. 500 Damage, Fixed. If you send the opponent flying to the wall, they will get an additional 500 damage PLUS you'll get a chance to do more combo. Wall is a good friend if you're not on the receiving side. Assist 1 = Bazett dashes to the center of the arena and executes a combo to the active enemy direction. Assist 2 = Bazett dashes to the center of the arena and jumps to the air (active enemy direction) while executing a knee-attack. Assist 1 = Fires 3-way wave to the enemy. Assist 2 = Sends a 'swamp' to the active enemy. If hit, the enemy will be pinned for a while. Press A+B+C while attacking. Costs 1 Mana. 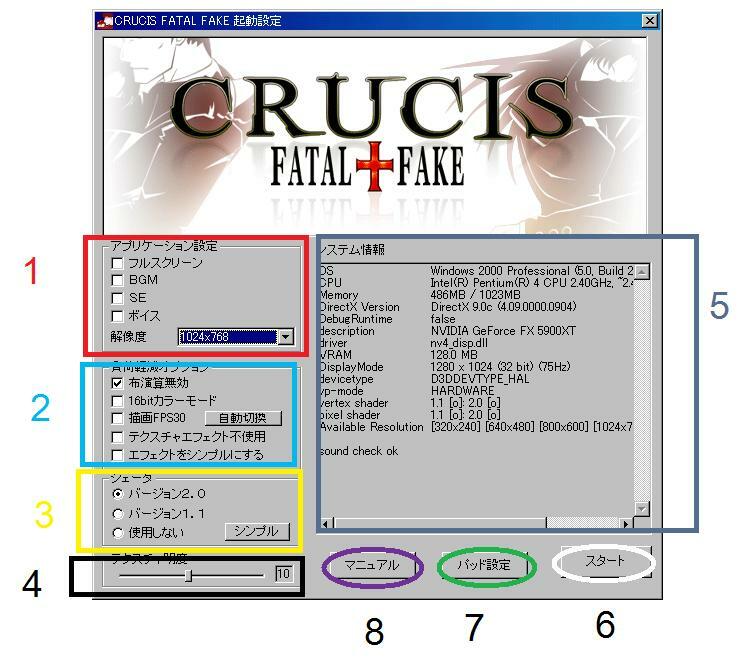 You may re-do your attack(s) from the beginning. If used against a guarding opponent, this move can be used consecutively. You may only use Combo-cancel for 1 time (in a combo) if the combo successfully hits the opponent. Press A+B+C while opponent is using their Power Up. You will get an Ability Burst without having to pay 1 Mana. Assist 2 = Rin throws a few jewel to the sky. After a few seconds, some needle will fell down to enemy. 0 Damage, but pin the enemy for a short time. Assist 1 = Soichiro moves to the middle of the arena and punches to the active enemy's direction several times. Assist 2 = Soichiro moves forward and executes a counter-attack action. Assist 2 = Dark Sakura opens a swamp under her, damaging (and stunning) any opponent nearby. While she's opening this swamp, she can't teleport. When he's guarding, press 4+D or 1+D to do a long, back-step dodge. The Rune effect charges both player's mana. In addition, the opponent cannot do tag, assist, and use any command spell when this ability still active. 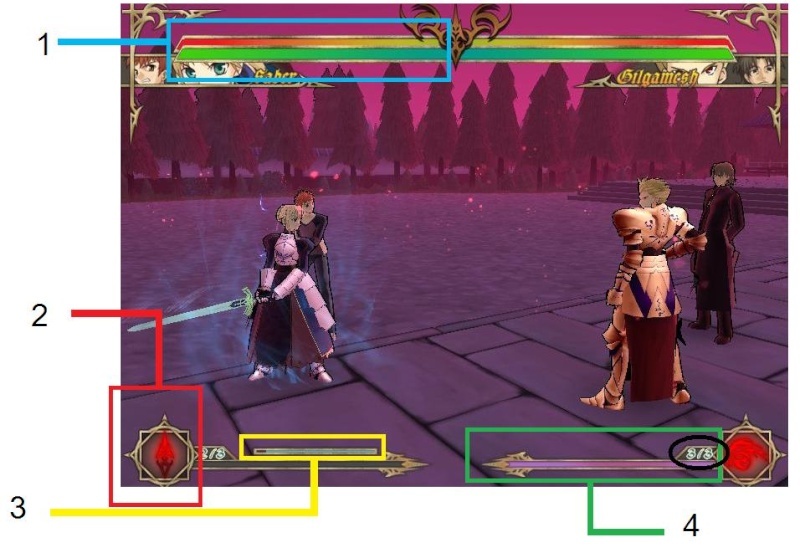 B+C, can be used only when Saber is executing an attack or combo and she has the wind aura around her. The aura will change to Gold (indicating a mana burst), and disappear. Wait a little bit for the wind aura to regenerate. Caster will be flying - in place of jumping. 2. Assist 1 = Shoots a beam through the enemy. Able to resurrect 11 times, each times equal to 1 Mana. (If he resurrected with 4 mana, it means that he has resurrected 4 times). You will be unable to guard. In exchange, Berserker will have a super-armor (Doesn't flinch when he's attacked) with some limit. When you're going to be hit with an attack, press 4. The attack won't damage you even a bit of HP (no recoil). Indicated by a green blink when you're guarding. When you're going to be hit with an attack, press 6. Archer will block that attack instead, and allows you to do counter-attack. Automatically when you're opening the ability burst (if you have more than 1 Mana remaining). When you take a hit from the enemy, the chanting will stop. After all the aria has been casted, you may use the Unlimited Blade Works' Last Resort. Hides the character's sprite, including his shadow.